Why does maintaining a clean watershed matter? Well, water running through the University of Georgia’s watersheds flow into the lakes and rivers which you kayak, hike and swim in. We are WaterLight, a web-based application whose goal is providing easy access to recreational opportunities in bodies of water connected to those watersheds. The four watersheds on the University of Georgia’s campus are not easily seen and are overlooked. Partnered with Vestigo, we are using mapping technology to bring the watersheds to “light” by attracting the Athens community to enjoy, learn about, and care for the watersheds. Because we are in collaboration with other various groups on campus, finding our niche for this application has been a challenge for us from the beginning. The idea for a recreation-based app was not the overall concept that we came up with first go round. Originally, after speaking a lot with Watershed UGA, we were going to have our project be educational and in the form of an IOS app. After careful consideration and thinking (for half of the semester to be exact) we decided that we wanted to go in a different direction. 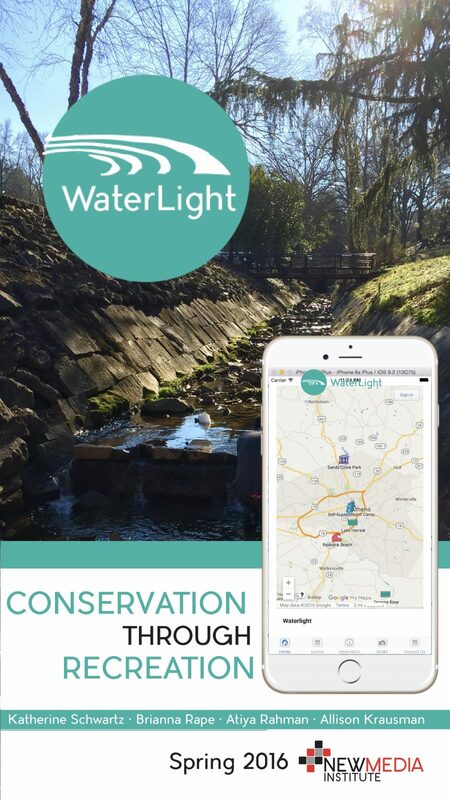 When coming up with the new concept for WaterLight, the one you see today, we wanted to make an app or website that readily got students involved in the Watershed initiative in a way they would find fun, exciting and worthwhile. We wanted to make an web-based application that went beyond educational information…. thus the new version of WaterLight was born. Involvement: Encourage users to volunteer to help restore and maintain the watersheds through various service opportunities. Education: Provide a source of information about the University of Georgia’s four main watersheds. Awareness: Increase awareness in the Athens area of the presence of the watersheds on campus through engagement.